Bake a sheet cake the size that you need. 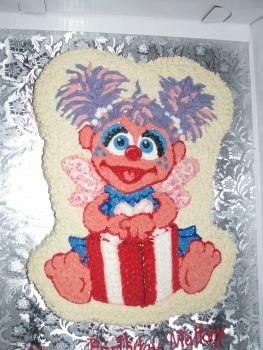 With an icing filled bag and round tip #5 draw Abby on the cake top, or you can use the parchment paper transfer method. Cut the cake away from the Abby design leaving a 1"to 2" border around the Abby drawing. You will be using a round tip #5 to do all the outline work and the star tip #16 to do all the fill in work. Outline the face, arms, and feet in red icing. Also outline the nose and mouth in the red icing. Make a pink icing and outline the tongue in pink and then fill it in with the same pink. Now fill in the rest of the mouth and nose with the red icing. Use the pink icing and place a curved line on the nose to highlight it. Now outline the blue eyes with light royal blue icing. Use a black icing to make the dot in the center of the blue eyes, and to outline the eyebrows. Fill in the eyebrows with the same black icing. Now fill in the blue eyes with the blue icing. Outline the area above the eyebrows with the blue icing and fill that area in with the same blue icing. Outline the whites of the eyes using white icing and fill them in with the same white icing. Using the blue icing place three dots on each cheek. Now fill in the face arms and feet with a pinkish flesh colored icing. Make a light pink icing and outline the wings and ribbon on the package. Don't forget the bow loops right above her hands. The outside lines of the box are outlined in red icing and the inside lines in black icing except the top lines on the ribbon area which are done in red icing. Now fill in the ribbon and wing areas with white icing. Fill in the rest of the box with the red icing. Sprinkle pink edible glitter on the wings. Make a dark blue icing and outline all the dress sections. Fill in the dress with a medium blue icing. Make the hair using the #16 star tip and a light pink and a light purple icings, making curved strokes. Make three white daisies at the base of each pony tail. Place a yellow dot on the center of each daisy. Finally fill in the top border and sides of the Abby Cadabby cake with ivory icing.